Derm Exclusive Review (UPDATED 2019): Don't Buy Before You Read This! 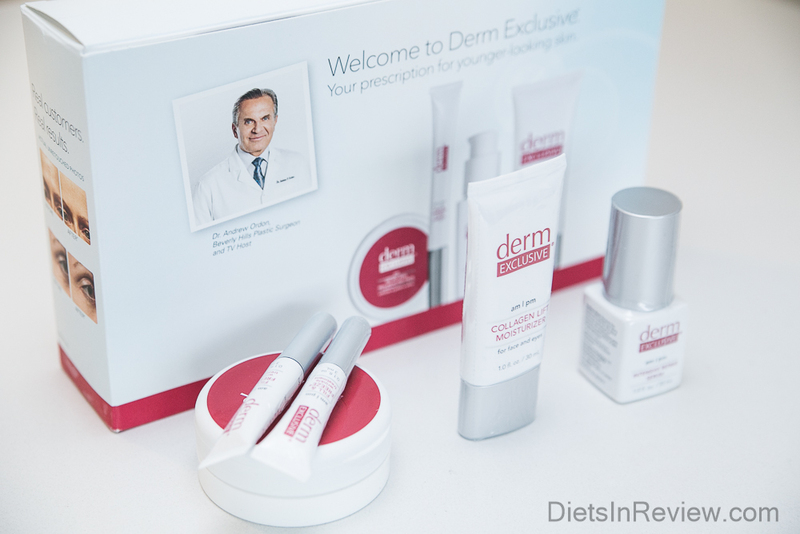 Derm Exclusive is a collection of anti-aging products formulated by board certified Beverly Hills plastic surgeon and television host Dr. Andrew Ordon. As the aging process affects everyone differently, surgical procedures are not always the answer. The Derm Exclusive line was developed as an alternative treatment to cosmetic surgery while still providing similar immediate age-defying results. The basic collection includes 30-day supplies of the Micro Peel Resurfacing Pads, Intensive Repair Serum, Collagen Lift Moisturizer, and the popular Fill & Freeze Wrinkle Treatment. Used together, the product line promises to address all the visible signs of aging without the use of needles, scalpels, or lasers. 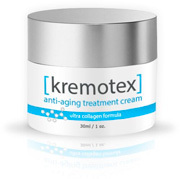 Click here to see before and after pictures, and find out what benefits Kremotex can offer you. Matrixyl 3000: Anti-aging peptide that promotes collagen production and skin healing. Some studies have suggested it is more long term than many other anti-aging ingredients. Argireline: Synthetic peptide compound used to reduce the facial contractions that lead to fine lines and wrinkles. Some studies have suggested that over time, it can break down the muscle tissue that naturally firms the skin, causing skin to sag. Myoxinol: Complex of oligopeptides extracted from Hibiscus esculentus L. (okra) seeds. Believed to inhibit the movement of muscles that create facial expressions. Salicylic Acid: Also known as beta hydroxy acid, this anti-inflammatory ingredient is used in many skin care products as an exfoliant, deep cleansing agent, and also helps to soothe aggravated skin, and minimize uneven skin tone. Collaxyl: A peptide that aids in skin healing and regeneration of damaged cells. Dimethicone: Silicone based, organic polymer that forms a barrier on the skin, sealing in moisture. It is also easily spreadable, and leaves skin silky and smooth to the touch. Palmitoyl Tetrapeptide-7: Synthetic peptide compound that reduces skin damage and inflammation. It also is believed to stimulate the regeneration of collagen. Shea Butter: Natural antioxidant with superior healing and moisturizing properties, and helps soothe sunburn, eczema, and other skin blemishes. Additionally, some ingredients may not perform as well as the product claims. The ingredient Argireline, for example, has produced conflicting results. Its initial line and wrinkle reducing results encourage customers to keep using it, but some research suggests that prolonged use may have reverse effects. Over time, it can actually start to break down firming muscles and destroy skin cells that promote healthy collagen production. Before using Derm Exclusive, or any skin care product, one should always check with a specialist to discuss the possible risks associated with the ingredients. 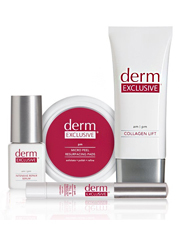 Derm Exclusive has a very complicated pricing system when you purchase directly through the manufacturer. The kits, or collections, range from $39.95 for the 30-day supply 4-piece Introductory Collection, to $119.95 for a 90-day supply, to $164.55 for the 7-piece Ultimate Collection. You are able to call to order individual products, but only after you place an initial order (and enroll into their autoship replenishment program). Furthering doubt about the value is the autoship replenishment service you are forced into when placing an order. Like many other skin care companies that offer this type of subscription program, it is causes confusion and unwanted hassle for those who miss the terms in fine print. If Derm Exclusive is within your skin care budget and sounds like something you would like to try, just be aware that the responsibility to call and cancel is on you. Many customers have had considerable issues simply cancelling their subscriptions, returning unwanted shipments, and getting the company to stop charging their credit card, even after returning the products. Email: There is no direct email listed, but there is a contact form on the Beachbody website. There are over 1,000 documented complaints against Beachbody, LLC through the Better Business Bureau and other watchdog sites. Like many other skin care companies, their autoship program is the reason for many of the customer complaints, though there are many complaints about the product itself. The customer reviews of Derm Exclusive range from nothing but positive to not at all satisfied. Many negative customer opinions stem from their complicated returns process, misleading advertising, and poor customer service, but many claim the products simply do not do what it promises, or they did not receive enough product to judge the results. Most do not feel it is worth the high price, or the toll of trying to return it and stop the auto billing. 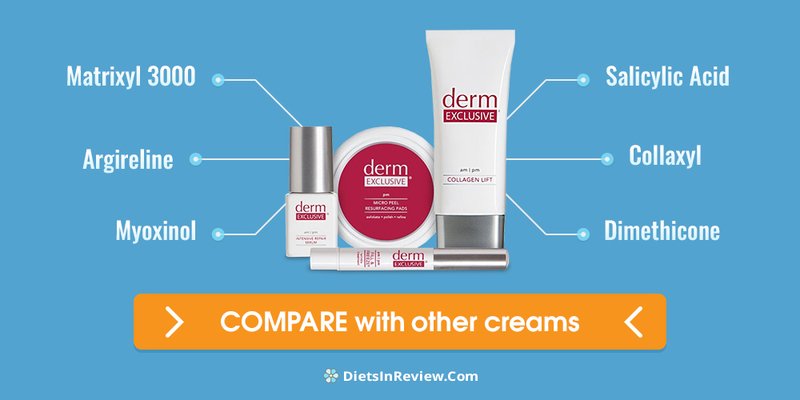 How Does Derm Exclusive Compare? Conclusion – Does Derm Exclusive Work? Not only does Derm Exclusive promise to address the visible signs of aging, it also claims science-backed research and risk-free trials. It may address some signs of aging, but there are absolutely no clinical trials or detailed information provided on how it works, and that alone is a risk for a consumer. Derm Exclusive may works wonders for many some, but most say it didn’t work, or that it provided opposite results than intended. Consumers should also consider the nightmare of the autoship program if the lack of information and proven results are not enough to steer toward a more reputable and proven product.